The Cyborg, on his Sinestro throne, laments and recalls his origin, and his wish to die, from being involved in the Fantastic Four style crash, to Superman's interference, to Mongul and Coast City, to Sinestro and his new Warworld in one long flashback. Cyborg, recalling this, digs up his wife and tears her in half, indicating he shares the Anti-Monitor's desire to end existence. The JLA satellite monitor sees Manhunters coming, and the base is breached rather quickly. Manhunters take the satellite apart. Cyborg Superman aids them, taking down heroes until Superman arrives, smashing into him. Sinestro arrives, and chaos ensues. Superman and Cyborg smash each other about, with Superman eventually being thrown into the Statue of Liberty, knocking off her head. 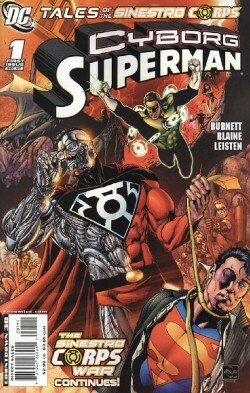 Cyborg stands over Superman triumphant, shouting that he will have his death! Story - 4: This is, for a Cyborg Superman geek, pretty much heaven. Seeing Superman and Cyborg battle is something that really hasn't happened for quite some time, and if you add into that a healthy dose of character, care, and reference to the origin long thought destroyed by New Earth. We find out how the Statue of Liberty's head falls in the poster, and we get a strong flashback story of all of Henshaw's past, to bring new readers up to speed, in an emotionally compelling way, largely in the same style that Geoff used successfully in his Flash and now JSA runs. The only beef I have (and thus the knocked point) is that the origin took up more than half the book, and there were places used for the new JLA that could have easily gone to more character or more fight. There were a LOT of caption pages in this book. Art - 5: Everything here is pretty exquisitely rendered, and well worth the price of admission. Even the opening page, where Cyborg looks a little overmuscled and gangly is artfully justified, given that it's a splash exploiting how large he is now versus how small he must be on the inside, so I'll take it with all the rest (and really, all of the rest is in fine form) and say that this is probably some of my favorite art this year so far. Cover Art - 5: I looked at the ad that showed this cover, and soon after, I begged Steve to let me review this, because I wanted an excuse to buy it, because this image is so awesome. Yeah, it breaks the depicting what happens rule, but the image is so incredibly compelling, this is one of those rare instances where you just happily let it slide. Incredible.